When you go out to eat do you order food from the kids menu for your kids? or Do you order them an actual adult platter? I know we are all concerned about saving money and what not, but children are humans too. Why can’t they have a nutritious or amazing meal like we do? Would you like to go out to a restaurant and only have chicken fingers, hot dogs, grilled cheese and french fries? Kids need to know that they can have healthier or delicious meals when they go out. If you’re concerned your child will not finish an adult meal, you can take it home for leftovers. Ask the waiter or waitress for a take out box when your childs meal arrives put some in the box to go. 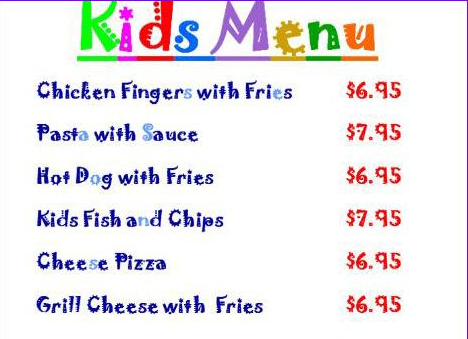 I’m not judging anyone that likes to order from the kids menu, but I feel that kids aren’t given a big enough option. You will be surprised at what a child will pick and enjoy. Until restaurants start to offer a healthier and bigger options for kids try this technique out. We are just limiting our children’s palates when we offer them the same bland, meaty, cheesy, fried food. I’d feel seriously bad if and when I am eating a healthy meal and my kids are eating down high fat, high sodium, and very sweet foods. Previous Post Famous Favorite Cooks! I totally agree, and I must admit we often just pick from the kids menu for no better reason than we’ve got into the habit of it and I imagine the restaurants find it easier to do those meals for kids. But now I think about it we were much better at thinking about what our daughter was eating when she was very first eating with us. Hmmm, thank you for this post, I’m definitely going to do what you suggest and order adult, more healthy meals and ask for a doggy bag!! I totally agree. I remember, I’d get stuck with crappy fish sticks as a kid while my parents ate real food when we went out. Even if they had picked out cheaper dishes on the adult menu and said, ‘You can have this or this or this.’ it’s better than being relegated to the kids menu. My son is allowed to order whatever he wants at a restaurant, from the kid or adult menu. Our meals at home are healthy and nutritious and he has a very sophisticated palate, so if he wants to occasionally dive into the “chicken nuggets and fries”, I’m okay with that. We rarely serve that sort of thing at home. Most restaurants here in inland rural Andalucia offer 3 portions sizes of the same dish – tapas, half portion, full portion. It´s customary to order a few dishes and everyone shares, but if children want something particular it´s easy to just order a half portion – but not burgers or fish fingers, just the same as the grown ups are eating! When my kids were smaller, I used to do just that. Or, better still, since I had three boys at the time, I’d order an adult meal with an extra plate for the older two. More frequently less than or equal to the cost of two “Kid’s Meals”, I would split the adult meal between the two. Since portions have grown so large these days, it was easily more than enough for them. Only kids who have been introduced to a variety of foods and had the opportunity to try them will learn to love them! Well posted! I don’t understand why people don’t order entrees from the normal menu for their kids. I’ve always had an adventurous palette and loved trying new things as a child. Kids menus depress me!